Remember a time before technology, when good old-fashioned fun meant riding bicycles, swimming, climbing trees and playing kickball and tag until dark with neighborhood cohorts? Too much screen time, video games and months of winter in some areas leave families sedentary, separated by technology and accustomed to sitting indoors. Summer nights are made for spending time outside, and nature therapy is good for the mind, body and spirit. Staying constantly connected to social media, email and TV has been linked to stress, loss of sleep and depression, along with social isolation, feelings of low self-esteem and constant comparison. Now that warmer weather is here, say sayonara to the hand-held devices and turn your backyard into a playground for any age. The good news is it really doesn’t take much to make children happy or entertained. They like hands-on activities and areas they can explore – an overgrown bush where they feel a bit hidden, a tire swing, a climbable tree or foot path into some woods, says Julie Moir Messervy, landscape designer and owner of Julie Moir Messervy Design Studio in Saxtons River, Vt.
“Kids just need to get outside and play and I think sometimes parents forget how important that is,” she says. When it comes to finding a place for children’s play equipment, the challenge is incorporating it into a backyard design in a way that it blends, so it’s not a bulking eyesore. But you also want to make sure it’s accessible, safe and functional as children grow and their interests change. Most parents settle for traditional swing sets and jungle gyms, but a lot of it depends on space and budget. Some designers and families opt for elaborate treehouses with connecting suspension bridges, zip lines, climbing walls and high-tech features. Messervy has found simple things like a sandbox (kept covered), stepping stones, tree stumps, or a pond with fish will keep children just as occupied and engaged. It doesn’t have to cost a lot of money, or involve technology, and the best play spaces entice other children to want to come over and be part of it. Messervy’s company offers online design services for families and also has an app, Home Outside (homeoutside.com) that’s free to use and helps homeowners design their own backyards. The Home Outside app includes 700 pre-drawn elements and enables users to create a plan with their house, driveway, and other permanent features, then add, arrange and edit landscape elements. Getting outside affords exercise, fresh air and interaction with nature. Children want to be able to play and explore and create, which is why many kids grow bored with swing sets and preassembled play structures. Children want to feel like they’re completely hidden but feel safe at the same time; they want to see out, but they don’t want to be seen, she explains. Messervy suggests taking children to a garden center to choose one special feature and some plants and let them decorate and plant their own little area in a garden. It exposes them to gardening and encourages them to become lifelong stewards of the earth. 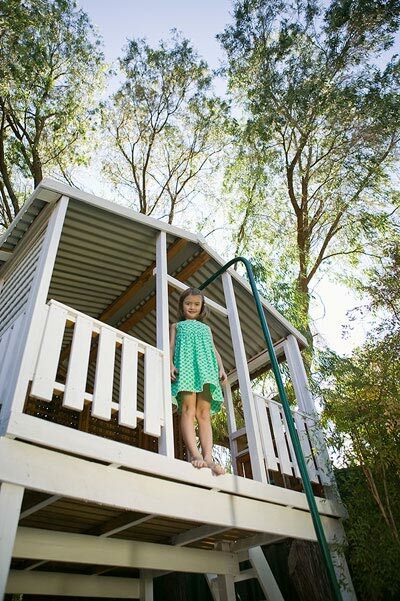 Vertical play structures, or something built in a tree, is a good alternative for a small yard. It also gives children a sense of secrecy and privacy, but it’s important to make sure it’s well lit. Lighting is one element that is often overlooked when it comes to active play areas in the backyard. It’s important for both security and safety. It’s also easier to plan for during the design stage, including how and where to run wires, transformers and switches, even if the lights are added later, says A.J. Coleman, an outdoor lighting designer with McKay Landscape Lighting in Omaha, Neb. McKay, a member of the National Association of Landscape Professionals, specializes in low-voltage lighting and provides professional outdoor and landscape lighting services for homes and businesses in Nebraska, Iowa and South Dakota. Beyond pools and entertainment areas, more clients are requesting soft lighting for play areas in the yard, Coleman says. Many homeowners spend a lot of money on adding a zip line or clubhouse and then realize their children can’t use them after dark. They may be in a side yard or dimly lit area and the parents want to be able to see their children. LED lighting has made it more energy-efficient and easier to install, and low-voltage lighting can create a rustic feel to larger backyards casting a softer glow than a big flood or stadium light. For elevated areas, the goal is well-placed, softly cascading light rather than having a big floodlight attached to the house that can be blinding as you’re coming down a slide or zip line. “One benefit of low-voltage is it’s kind of nice and soft and unique in a way, where you can light those spaces up and not make it look like a stadium,” he says. • Enclose play spaces with a wall or hedge. • Remove containers, tires or anything that could hold standing water and breed mosquitos. • Provide shade to protect against extreme sun and heat. • Create safe surfaces with wood bark mulch, sand or pea-gravel to prevent injuries from falls, which account for 70 percent of playground injuries. For those building clubhouses or designing outdoor play spaces, the trend is moving toward using natural, recycled or locally sourced materials rather than plastic or pre-constructed jungle gyms and leaving some open green space for playing tag or catch. Another element of good outdoor design is to create spaces for entertaining that children and adults can enjoy together. Fire pits, hammocks, vegetable and flower gardens, even outdoor spas and yoga or meditation areas can be used by teenagers and empty nesters. In areas like the Southwest, where people have smaller backyards and warm weather year-round, in-ground pools are still a popular outdoor feature. One in three homes have in-ground pools in the Las Vegas area, and while it can cost $45,000 to $70,000 for a pool, spa and additional amenities, it’s a feature that makes a home more desirable when a homeowner goes to sell, says Joseph M. Vassallo, CBP, president of Paragon Pools Las Vegas and Association of Pool & Spa Professionals Fellows. Vassallo, an award-winning pool designer and featured designer on HGTV.com, and his son, Joe Jr., help design pools and entire backyards, including outdoor kitchens, fire pits and other elements. Vassallo works with landscapers and contractors to connect and extend indoor and outdoor spaces with exterior pocket doors, covered patios and all-weather furniture. Most of the time, homeowners decide to put in a pool for their kids, but swim and therapeutic spas and smaller pools with fountains, jets and submerged benches appeal to all ages. For water conservationists, per square foot, owning a swimming pool uses less water than it does to water the same area of grass, Vassallo says. And new technology and maintenance-free options take the hassle out of owning a pool so homeowners can spend more time enjoying it.